Observation and Comments on our Modern Ginanic Literature 1979-02-25 | Ismaili.NET - Heritage F.I.E.L.D. The First part of the report is attached here in PDF format. The second part, Appendix 1, Review Sheets has been added. -The second part provides a comparative analysis and comments on some major changes that have taken places in Ginans book published after the Paris Conference.1975 outside the directives of the Imam. The Review Sheet comparative Analysis and Comments of some major changes in Ginan-e-Sharif Bhag Pahelo and Bhag Bijo which misrepresent in their introduction page that the work was undertaken as per Paris Conference Resolutions. Then the last part gives a guide to understand the ginanic literature. We have sliced the complete report (90 MB) in several small files to allow for smaller files size and faster download. 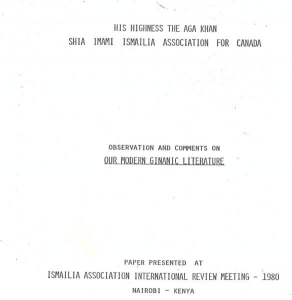 This is an important report by Ismailia Association for Canada that allows us to understand how, in the 20th Century AD, the ginanic literature has been butchered by people who had no understanding at all of the subject.